What triggered this massive policy shift in those 14 days? It cannot be a coincidence that, only four days prior to Ghani’s call for peace, a Taliban spokesman vowed that the group would ensure the security of the Turkmenistan-Afghanistan-Pakistan-India (TAPI) natural gas pipeline in their areas of control. TAPI was first negotiated in 1995 as a U.S.-funded pipeline independent from the Russian network. It would transport natural gas from the abundant fields of Turkmenistan to the energy-hungry industries of Pakistan and India. The Taliban regime in Afghanistan initially supported the pipeline, but negotiations halted following the 1998 U.S. embassy bombings and the Taliban’s pledge of support to Osama bin Laden. In December 2002, just over a year after the coalition invasion of Afghanistan, new terms for the TAPI project were agreed upon between the leaders of Turkmenistan, Afghanistan and Pakistan. What has changed – 15 years later – that makes peace with the Taliban and construction of the $10 billion project necessary? Behind the Taliban’s rhetoric that TAPI is “an important element of the country’s economic infrastructure and [that] its proper implementation will benefit the Afghan people,” I would argue, lies a secret deal with the Afghan government and its U.S. sponsors that has been years in the making. This deal likely provided the U.S. with the assurance required to withdraw the bulk of its forces, secure in the knowledge that their vital interests will be maintained under Taliban governance. 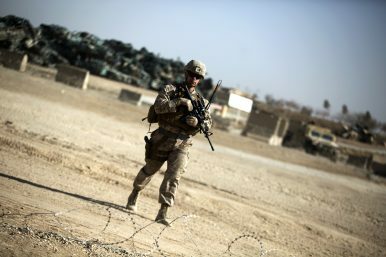 We might thus understand the recent developments in Afghanistan as an indication that the U.S. has recognized that it is lagging in a great power struggle over infrastructure and economic dominance in Eurasia. China’s Belt and Road Initiative (BRI) has made massive strides in its first five years, overtly challenging long-standing American primacy in this field. During 2016 alone, the Asian Infrastructure Development Bank (AIIB) – China’s answer to the World Bank and a major source of BRI project funds – invested $1.73 billion in nine major projects across Asia and the Arabian Peninsula. The U.S. cannot compete with China’s highly centralized decision-making structure and large public resources, particularly as far afield as Central Asia. It has instead historically exerted strategic leverage by working with governments and private enterprise to control the supply and transport of natural resources. The ongoing construction of TAPI suggests that the U.S. may be reinvigorating this approach. To such an end, we can identify political similarities between TAPI and the Baku-Tbilisi-Ceyhan (BTC) oil pipeline constructed in 2006. Like BTC, TAPI is a U.S.- and allies-funded alternative to diminish Russian and Chinese influence in Eurasia. Both pipelines are intended to bypass and isolate competing Iranian pipelines (in TAPI’s case, the Iran-Pakistan-India gas line). Characteristic of the new political paradigm, TAPI is also a means of ensuring that hydrocarbon-rich Central Asian countries – such as Turkmenistan – do not exclusively rely on China for their export markets or potentially fall into the same ‘debt trap’ now ensnaring other subscribers to BRI projects. If this analysis holds true, we can expect in the coming months (and years) to see the U.S. establish further political alternatives intended to counterbalance China’s influence in Central Asia, particularly as flaws begin to emerge in BRI projects. There are rumors of a nascent U.S.-led competing strategy driven by an initial $200 billion Japanese investment. Although this is touted as an “alternative” rather than a “competitor” to BRI, it will necessarily compete for the influence acquired from funding similar projects. We should, similarly, be on the lookout for signs of political agitation among the Uyghur peoples in Xinjiang, China, which would force China to address more pressing domestic concerns than its current geoeconomic expansion. The United States’ winding down of the Afghan conflict is, in this context, the lesser of two evils. With its interests assumedly secure in Afghanistan under the Taliban, it will likely devote its attention (and resources) to securing – or undermining China’s efforts at securing – the region as a whole. Nicolas Johnston is a graduate of the Australian Defence Force Academy (UNSW Canberra). Correction: A previous version of this article stated that the AIIB funding uses China’s renminbi. It uses U.S. dollars.